Pyaar Kiya Nahin Jata Ho Jata Hai. You may wonder why I am humming this song written by Anand Bakshi for movie Woh Saat Din (1983, Music Director- Laxmikant-Pyarelal) which translates into ' Love is not planned it happens '. This song came in my mind while thinking about ' Love Jihad ' a new phenomenon to spread hatred and creating misunderstanding between the communities. Before going further in this topic lets understand what is Jihad. Jihad means 'struggle' , it is striving in the way of Allah. This is the most misinterpreted word in of Quran in the modern world. Essentially Jihad is an effort to practice religion in the face of oppression and persecution. The effort may come in fighting the evil in your own heart, or in standing up to a dictator. Military use is included as an option, but as a last resort and not ' to spread Islam by the sword' as the stereotype would have one believe.Many fundamentalists spread terror and violence in the name of Islam and Jihad. It is better to take actions against them rather than seeing the whole community with a same eye. A type of terrorism funded by some terrorists organisations in PoK , Pakistan and some Arab countries. Handsome Muslim boys are trained to lure non-Muslim girls by changing their names. They dressed in branded clothes, carry expensive phones , roam in costly bikes so that non-Muslim girls started loving them. They eloped with these girls and marry them. Force girls after marriage to accept Islam. Don't give mobile phones to girls. Accompany girl when they go to markets and keep them away from Muslim shops and shopkeepers. Take out them from Muslim majority schools or colleges. Marry them as soon as possible with suitable boy of their castes. Women organisations and some scholars believes this strategy as another weapon of patriarchal society to keep women in limits of four walls of the house so that they will not reach ahead of men. I don't know why these people questions the intelligence of girls. Did they believe that girls are foolish and don't have mind of their own to be lured by things like branded clothes, expensive accessories to love someone. Some Yogis and Sanyasis who are giving hate speeches don't understands love. A sanyasi for me is one who have abstained himself from the worldly pleasures for the love of god. How one who loves god discriminate between HIS most precious creation humans on the basis of religion. It is a proven fact that nobody can force anyone to love someone, love is a natural feeling. The previous reported cases of love jihad in Kerala and Karnataka were proved baseless and those which are presented in the recent scenario have loopholes in them. An inquiry made on love jihad after Kerala reporting revealed that there is no proof of any organised gang behind these incidents. Don't we see betrayal in same religion weddings? 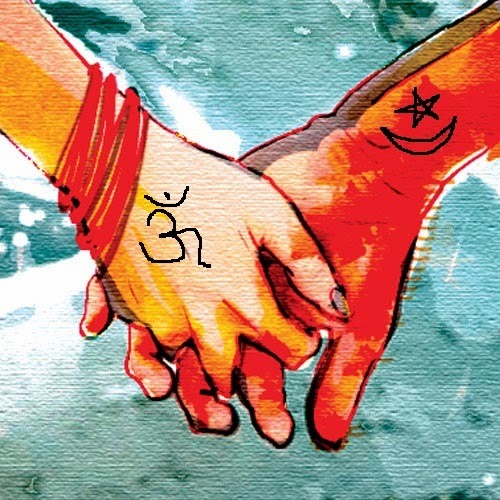 Some incidents of betrayal in inter-religion marriages buttered with baseless charges are highlighted to break the thread of oneness just for political gains. I am glad that recent by-polls in UP where 'love jihad' was used saw failure of those using it which means voters understood that unity is required for the development, violence would harm both sides. *some information sourced from Wikipedia and About religion. Bollywood movies have been trying to convey this for ages... Why don't they understand? Well written Cifar.. Love cannot be forced! Very true facts. I also love this song. Thanks Cifar for elaborating on what Jihad actually means and please don't ask whether they believe in a girl's intelligence. I think we are the stupidest creature for them after dodo.